All grow bed done and plant transferred and nothing much to do now, just sit back and wait. So without wasting time I bought new Tilapia Fingerlings, 8 for RM 1.00 (USD 0.30) I bought 160 total cost RM 20.00 (USD 6.00) good price for it. 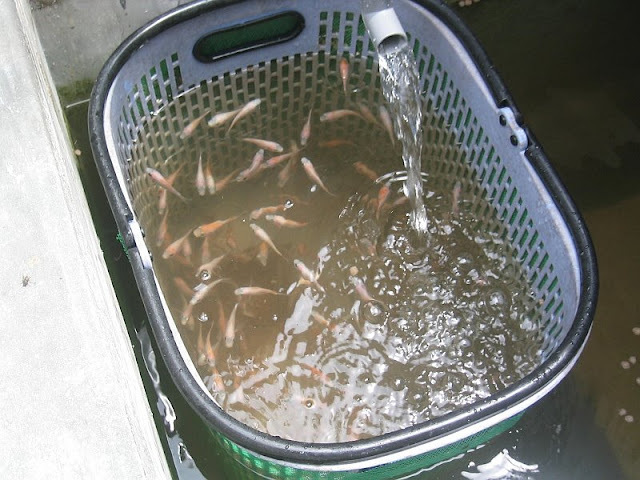 Above are those Tilapias the red variety, and I use a basket with fine plastic mesh wrapped around to contain them. Otherwise they may be fish food for the other bigger fish in the tank, especially those Yellow Tail Catfish (Patin) that "Senior" in the tank. I'll add more fish slowly, on a monthly basis to make sure they are balance with plant growth. Another shot of same, basket placed underneath water outlet so that aeration and fresh water circulation within the basket. On the plants, Tomatoes show sign of new root growth, that's good. I just hope there's enough nutrient and Iron in the water to ensure good growth. Affnan, what a great source of information your blog is! thanks especially for your open-source bell siphon instruction. I am too looking for a good tilapia fingerling source... it sounds like you found a great price and smaller quanititys (which is also what I need). Can you tell me where you found your source? Hi Jennifer, are you from Malaysia if yes then I can direct you to the location. I f you are from abroad then its not possible. 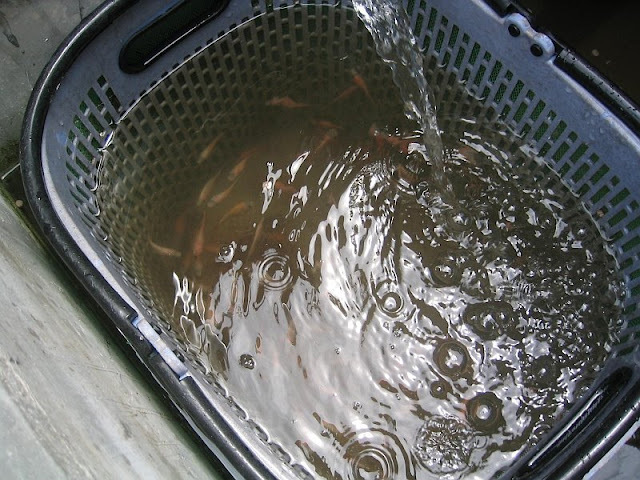 Are catfish a efficient way of preventing spawning in your system. At what size compared to the catfish are the Tilapia safe to introduce for growth in the pond? sean, Yes those cat fish will eat tilapia fry, if there are cat fish in the tank its best to wait for Tilapia fry to be more than 2 inches long. hi affnan!, im building a small scale aquaponic's about 75 percent complete...i would love to know the place to buy cat fish and tilapia fingerlings so i can get my self started, thanks....btw, ur blog is informative...keep on posting. Hoeden, where are you located ? There are post on the chat box on right on few places to get fry. If you have facebook, may I suggest you check me out. 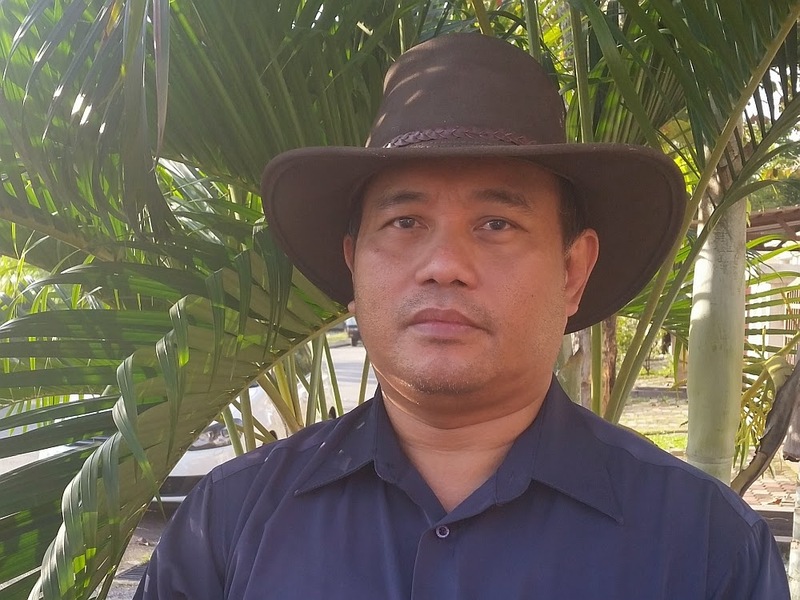 I will add you to Malaya Aquaponics group, there will be more people to assist in that group. Hi Samlf, JB area I am not familiar. Most Aquarium shops has Tilapia fry, scout around you may get some there. To get it from KL area would be not economical. Can you tell me were to buy live tilapia fingerlings. I live in houston tx. HI ABANG AFFNAN I WANT TO START AN AQUAPONICS NEED TO FIND GOOD TILAPIA FRY FOR IT CAN U HELP ? Where are you located, if you are familiar with Janda Baik area there are fisheries there, I get it from there unfortunately I hv lost the GPS coordinate to the place. Aquarium shop do some, but you have to find it because Tilapia is low value fish as ornamental they a bit reluctant to stock them. Hi Affnan, would it be possible for a group of children to come visit your aquaponic farm ? if yes, whats a good day/time ? Mine is a back lane, I can give you another place in Seksyen 18 PJ, that will be glag to assist. That place is much bigger and more appropriate. Send me email and I will give you his address and contact. Hi Affnan, I'm from Malaysia. Can you let me know, Where to get this Tilapia Fingerlings? I believe you got best price? Price varies, I got most fry from Lot 62 Selangor Green Lane. Can you give me the address and contact for where to get the fish fingerlings?